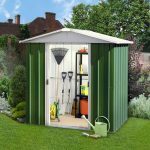 Absco Shed, Easy Store: If you have a relatively shallow garden then many storage sheds will take up too much of your precious garden space. That’s why we like this shed so much. 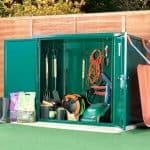 With a wide front and shallow depth it still delivers a good storage capacity while not taking up the whole length of a smaller garden. 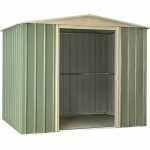 It also features a taller than usual eaves and ridge height which increases its versatility, and makes it suitable for taller items such as hoes and strimmers. The gentle pitch of the pent roof is just enough to carry rain and snow away, increasing the longevity of the material used in the shed, and protecting the goods inside. 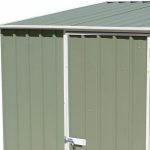 It also helps to give the shed a tough looking exterior, which can act as a useful deterrent against shed thieves, although the green paintwork stops it being too obtrusive or metallic looking. One thing that stood out for us about this shed is the SNAPTiTE assembly system. 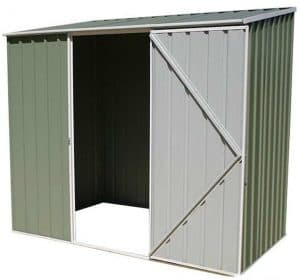 It’s unique to Absco sheds, so we recommend reading the instructions carefully before starting the work. If you do this, you’ll soon find that assembly becomes very easy and that you complete the installation quicker than you might have been expecting. Despite being lightweight, we were impressed by how robust this shed looks. Whilst also being available in a silver colour, for a no frills design, we liked the green colour scheme on this model, as it means that it can blend into the background of a garden, particularly as there are no windows. We found the paintwork smooth and evenly applied, which is a good indication of the attention to detail the manufacturers have given. One thing we noticed instantly is how tall the structure is for a pent shed, which will be very welcome news to taller owners. The ridge height of the shed is 1.92m and the eaves height is 1.80m which equates to 5’11. 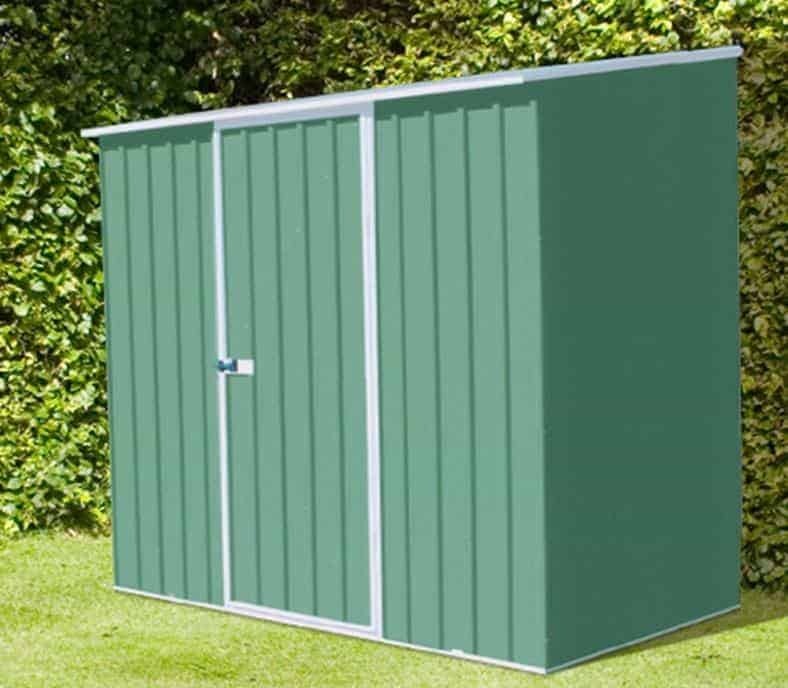 The external width of the shed is 2.25m, on the door side, and the external depth is 0.78m. This is the area that will need to be set aside when choosing an installation site. Whilst the cladding was lightweight, which itself contributed to the ease of assembly, it was solid and stable once snapped in place onto the frame. The SNAPTiTE assembly system involves snapping individual plates into place between an upper and lower channel. Each plate then joins into another. The effectiveness of this system is shown by how strong the structure was when installation was completed. 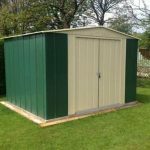 There is no floor supplied, as the shed is designed to be installed directly into a level concrete, paving or patio area. 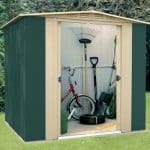 Because the shed is relatively lightweight you’ll definitely need to anchor it down, which is why we were pleased to see that a full anchor kit had been included as standard. It was good to see that a 20 year warranty has been provided against perforations caused by rust, particularly as this shed was originally designed for Absco’s native Australian market. The high quality cladding and pent roof, however, are more than adequate to protect the shed against the wetter challenges of the United Kingdom climate, and the warranty is an affirmation of this. 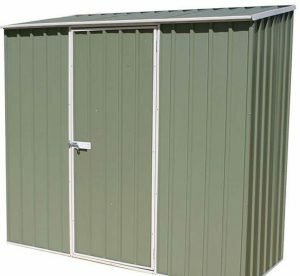 There is, of course, no treatment required as the shed is made completely from metal. There were two things we especially liked about the single hinged door, and the first is how strong it felt thanks to its bracing and powerful hinges. The other thing we liked is the door’s dimensions. Despite being a single door, its width of 0.75m is as wide as some double sliding doors we see. It was also noticeable how easy entrance and exit was thanks to the height of the door. No window is provided, which is as we’d expect from a metal shed in this price bracket. It would have been nice if there was an option to add a window or skylight though, as this would open up the shed to the possibility of being used as a small workshop. We feel that the shed’s sturdy looking exterior is itself a security feature, but this is certainly enhanced by the lack of windows. The shed could have been even more secure, however, with the inclusion of a padlock. Whilst a pad bolt is included it can be used purely to fix the door into a closed position, although it is holed and padlock ready. For that reason, we highly recommend purchasing a good quality padlock. 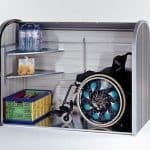 It’s a pity that no official optional extras are available to purchase at the same time as this shed, as we feel options such as adding a timber floor support or skylight would have added to its flexibility. One extra feature that we would definitely add, however, is a padlock. You’ll have to source this separately but a good quality padlock and alarm system from a reputable company such as Yale can cost as little as twenty pounds. 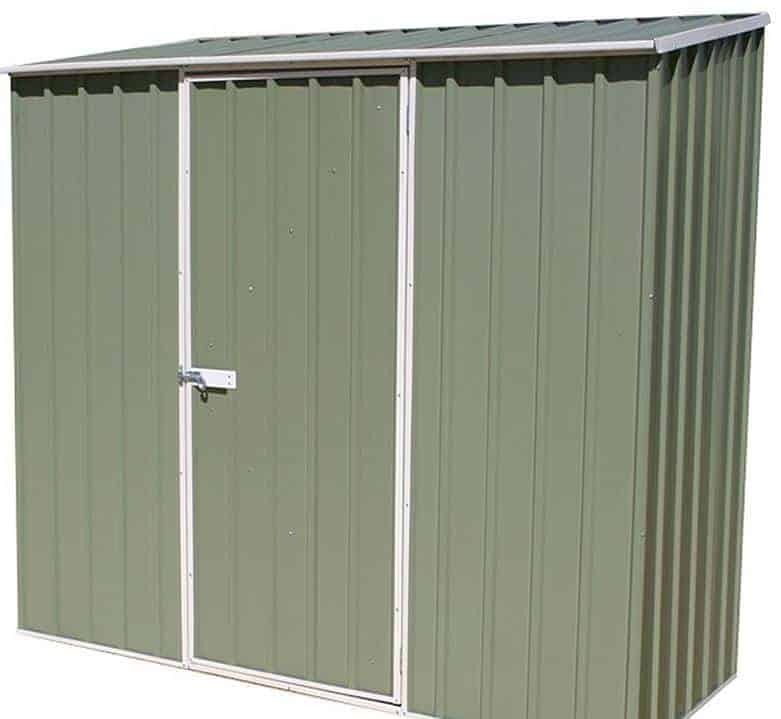 Absco are noted for the quality of their products in Australia, so we were very pleased to see that some of their metal sheds are now available in this country. We weren’t disappointed in the quality of this shed. Whilst the cladding is quite thin, it is strengthened by the high quality galvanisation which allows a long 20 year warranty to be provided against the appearance of rust damage. The shallow depth is more than compensated for by the wide frontage and tall eaves, meaning that you’ll be surprised just how much you can fit inside. Be warned, the SNAPTiTE installation system is unlike any other you’ve seen, so read through the instructions carefully. We did, and then found that two us managed to complete the assembly within three hours. With nothing extra to purchase, other than the aforementioned padlock, and a long warranty provided, this represents very good value for money. 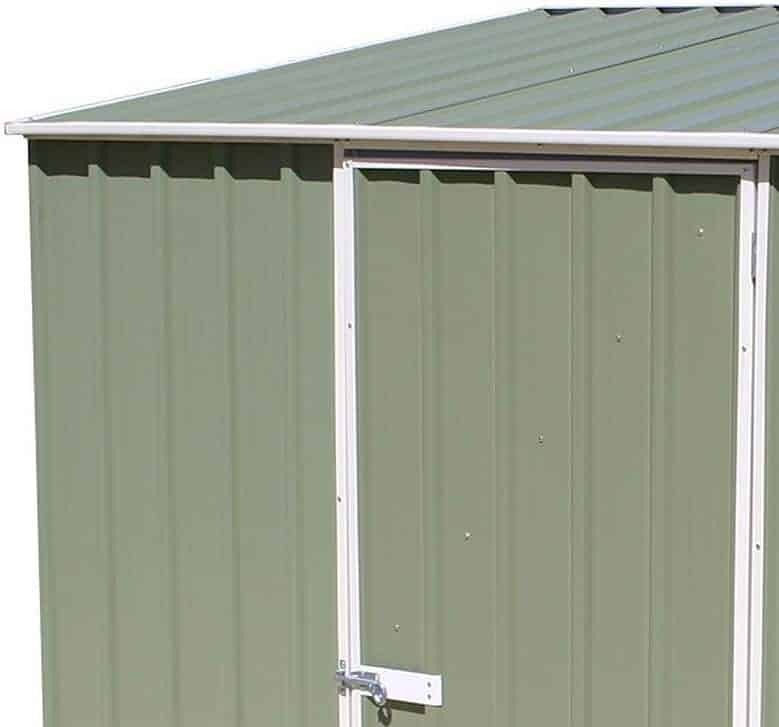 Final Thoughts: It’s easy to see why Absco have become so successful in Australia and New Zealand, and with sheds like this in their range we can see them making a major impact over here as well. There are lots of little touches that give added value, such as the inclusion of rust free screws and bolts in the anchor kit, and the well painted cladding which means that there is nothing more for the customer to do once the easy installation has been included. A generous storage space is helped by the tallness of the shed itself, something we found particularly welcome when not having to stoop to get through the door as we so often do.